You can find him in the following dramas on Viki or on the links to Soompi threads. I will post links down below Enjoy. Yang Yang and Tong Tie Xin singing Father and Son at CNY2016 CCTV Spring Festival Gala. 我就是一粒种子 I would be a seed. 我每天眺望你的高度 I look up to your soaring height every day. 不要忘记脚下那片泥土 Forget not the soil on which you stood. 却忘了如何跟你相处 But I've forgotten how to get along with you. 可心里全都清楚 But we understand each other from the bottom of our heart. 这就是血脉相传的定数 That's something destined in our blood. 给你我的祝福 I silently give you my blessings. 让我牵肠挂肚 Who has made me feel concerned each moment. 无论我光荣或屈辱 Whether I'm in glory or in shame. 要懂得忍让学会知足 You must learn to be tolerant and contented. 成为你的包袱 I will become your burden. 你带着我走出人生第一步 It is you who had led me to take my first step in life. Zhang Tian Ai plays Ying Huan Huan. Seems like there’s a change-and-switch of characters. Yang Yang’s character love two girls in the novel. I already read a flaming candle (hint: female leads war, rememberChusen?) and sometimes, ignorance is bliss! 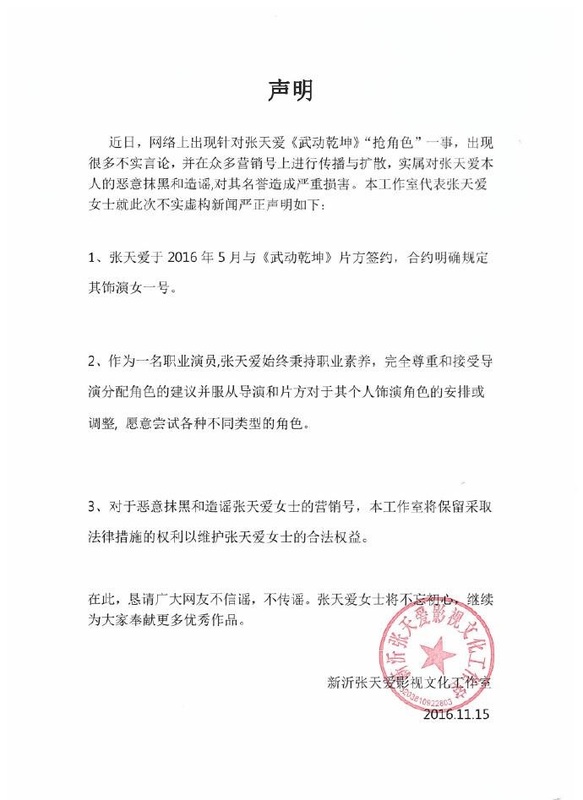 On 11/15/16 Tian Ai’s studio puts out a notice[here]: Zhang Tian Ai’s Studio officially comes out to say that Tian Ai signed with the production team back in May and it clearly states that she’ll play the female lead. As a professional actor, Tian Ai wholeheartedly respects and accepts the arrangement made by the director and production team. They will pursue legal actions against those who want to tarnish Tian Ai’s name. Directed by Zhang Li (Young Marshal), Martial Universeplans to have 60 episodes. It’s a new year so I really hope unkind rumors stop plaguing this production team. 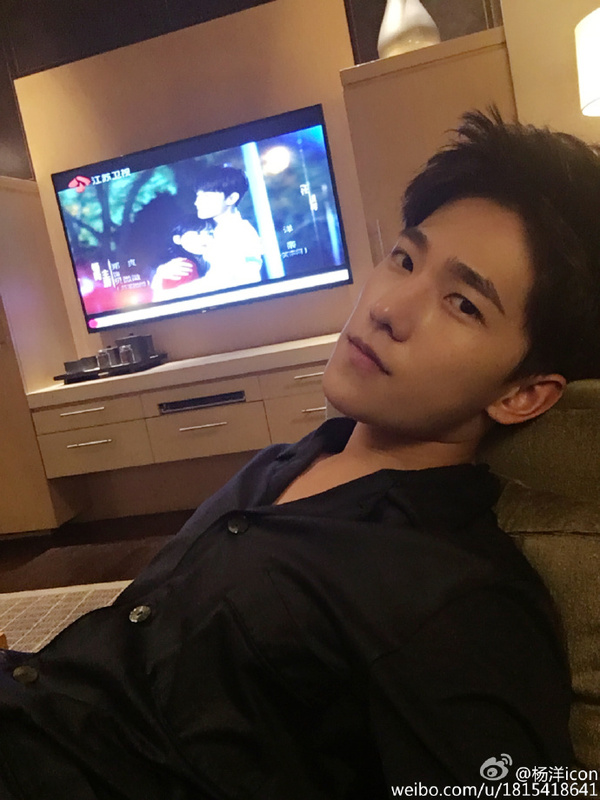 From Zhang Tian Ai‘s sudden change of character to Gina Jin‘s poetic reveal on weibo, then to the slandering of Yang Yang‘s reputation, it has been an exhausting ride. The production team just released a behind-the-scene video, showing how hard everyone has to work for the upcoming ancient drama, Martial Universe, based on xianxia novel Wu Dong Qian Kun (武动乾坤) written byTian Can Tu Dou. 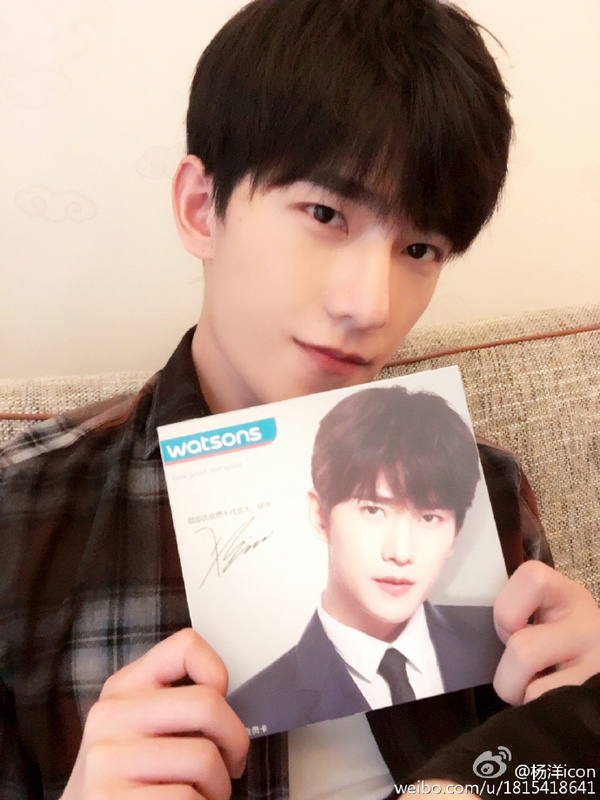 Yang Yang as Lin Dong, as child regarded as untalented by his clan, who’s destined for greater things. His family is banished from the Great Lin Clan, and the story follows his journey to avenge for his defenseless father after obtaining a mysterious Stone Talisman. Zhang Tian Ai plays Ying Huan Huan. She treated the entire team to ice-cream! Wu Chun. Yang Yang’s enemy. Wang Li Kun. Another girl in the male lead’s life. Ashton Chen Xiao Long as Little Flame, one with a special body, giving him the ability to merge into any bloodline. Happy happy for you! New stills for Martial Universe (武动乾坤) with Yang Yang, Crystal Zhang Tian Ai, and Wu Chun. Everyone seems to have messy hair except for Wu Chun. Lol. It’s out! It’s out!!! First teaser is out! AHHHHHHHHH. The movie adaptation of the same controversial novel Three Lives Three Worlds, Ten Miles of Peach Blossoms (三生三世十里桃花) written by Tang Qi Gong Zi featuringYang Yang and Liu Yi Fei. Yep, The drama version has Mark Zhao and Yang Mi. As expected, they didn’t give us a full-length trailer, only a quick teaser of the gorgeousness to come. *Updated with more official stills! Official Stills. To be released in Summer 2017. Me thinks they overdid his brows a bit here. LOL. A little Yang Yang in the house! This is him handing YOU! and YOU! and YOU! His heart. (yes, he’s a player!) heh. His photoshoot for COSMO in December. Yang Yang opens the awards night with Tang Yan on his arms. With the popularity of Just One Smile is Very Alluring,Yang Yang and Zheng Shuang have entered the top five spots (yesterday, he’s #1, she’s #3) on Baidu ranking, the top four spots were previously ruled by Zhao Li Ying and her various co-stars (Li Yi Feng, William Chan, and Lay) for the past month or so. Lol. The movie I Belonged to You or Passing by Your World (从你的全世界路过) stars Deng Chao, Yang Yang, Bai Bai He, and Zhang Tian Ai in a strings of mini stories about youth, love, and friendship based on the novel written by Zhang Jia Jia. The style of the novel is described as lighthearted bedtime stories of one person to another, recalling life experiences in a way that draws the readers into the shoes of each character. The latest trailer features the story of a bumbling youth (Yang Yang) inspired by his love for a tough police woman (Bai Bai He) to change his life around.